So the continuing saga of my basement apartment renovation moves forth. I say continuing saga because it feels like a journey to Mordor. Since my last post about this, I’ve managed to get a lot done. The walls were all covered up, mudded, sanded, and painted with what I think is a wonderful eggshell colour I picked up at Benjamin Moore paints (2026-70 for all the paint nerds). I fell in love with this colour after having used it in my kitchen at home, and since I feel a bright but neutral colour is essential for a basement apartment, I figured this was a logical choice. I think it looks good, but it also plays off the natural light in the unit. Another recent element of this renovation was insulation. This was something important that I wanted to address, as prior to the work being done and when the old tenant was in there, I noticed a significant transmission of sound between the main floor and the basement unit. I took a cue from Scott McGillvray on this one and used Roxul Safe’n’Sound insulation. After putting the drywall up, and packing the ceilings with the stuff (hence the necessity to use insulated pot lights), it’s as quiet as a library. The big main thing that was finished in the last couple of days was the completion of the wiring and the installation of some high efficiency electric convection heater systems by Dimplex and coupled wall mounted thermostats (3 to be exact). I didn’t want to go the regular route with electric baseboard heaters and am big on efficiency, especially if it’s electric, and especially if tenants are shouldering the hydro cost (which they are in this case). There’s a total of 4500 watts of heat in the unit, which is more than comfortable.The insulated pot lights were finished and all 18 of them use LED bulbs which are meant to last for 20 years. Considering the unit was also completely rewired, I’m curious to see how energy efficient the apartment is going to be. I’m doing a black and white tile kitchen and entrance, coupled with a contrasting darker colour for the bedroom carpet. Both the tile and the carpet have been ordered. I also have to buy some appliances, and get some kitchen cupboards and a counter top. I’m thinking of hitting up Restore from Habitat for Humanity for some of the last essentials. Beyond that, it’s taps, a bathroom basin and vanity, shower heads and handles, and a low flow toilet. I’m figuring I’ll have the place finished in the next two weeks. 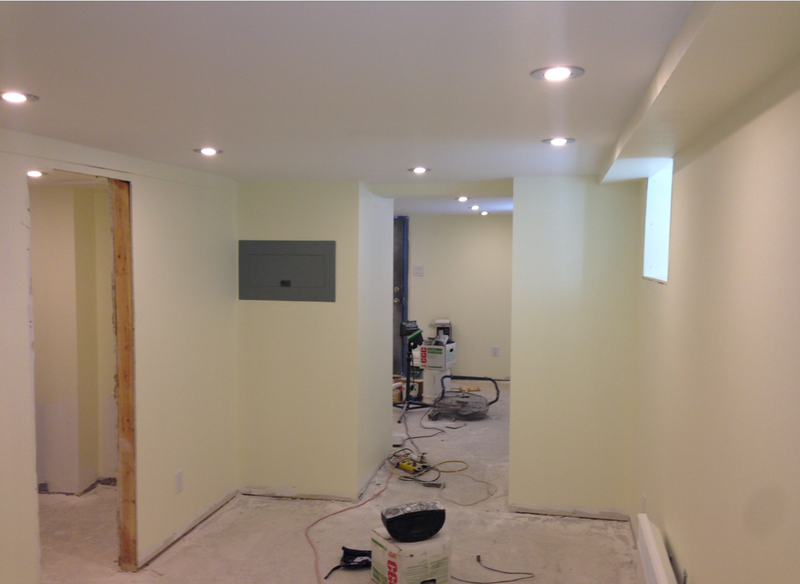 Have you renovated a basement apartment? Challenges? Hurdles? What were some of your experiences? Share your story with us!